Discover our ibis hotel close to Valencia Airport. Mr. Cédric Pagès welcomes you on behalf of the management at our ibis hotel close to Valencia Airport. This ibis hotel close to Valencia Airport is located at the Manises-Valencia International Airport an d is 219 yds (200 m) from the Rosas metro station, which provides access to the city's beaches. The rooms are fully equipped with air conditioning, heating and latest-generation WIFI. A restaurant, bar, buffet breakfast and parking are available. Friendly, helpful staff. Spotlessly clean, quiet room. Very well placed - 200 yards from the metro and one stop from the airport. Stayed here to sightsee Valencia as we had a very early return flight. Was a good choice - so handy to pop in and out of the city. Hotel is usual ibis budget standard - everything you need but no frills. It had a boarding pass printer in the foyer which was a great extra! Good hotel for a night prior to a flight. We felt the Ibis Budget Hotel Aeropuerto was a good stop over on our way out of the city with an early flight. Very helpful at the front desk with check in, printed boarding passes, good continental breakfast for 5€ starting very early in the morning prior to the early morning flights, arranged for wake up call and taxi to the airport which arrived right on time. the service is more or less always the same-It was really good . The room was clean and had everything needed for an overnight stay prior to my early flight. The staff were pleasant and professional. It is incredible to have NO glasses in room! Even the hotel is the best I met on Ibis Budget, I think it's inadmissible to have not where to put I think that even the hotel is OK, it is INADMISSIBLE to have not where put your toothbrush, toothpaste, shaving machine etc. Or to have something where to put water from a bottle. I understand the fact that ACCOR take care about plastics but a minimum deontology and customer care can be relevant. When I tell to the young girl from the reception (excellent smile!...) what I have to do to have a glass she told me that I must come from my room and... ask! And for that the hotel merit the score maximum 3 or 4. You always know what you expect at Ibis but this hotel was even better than that. 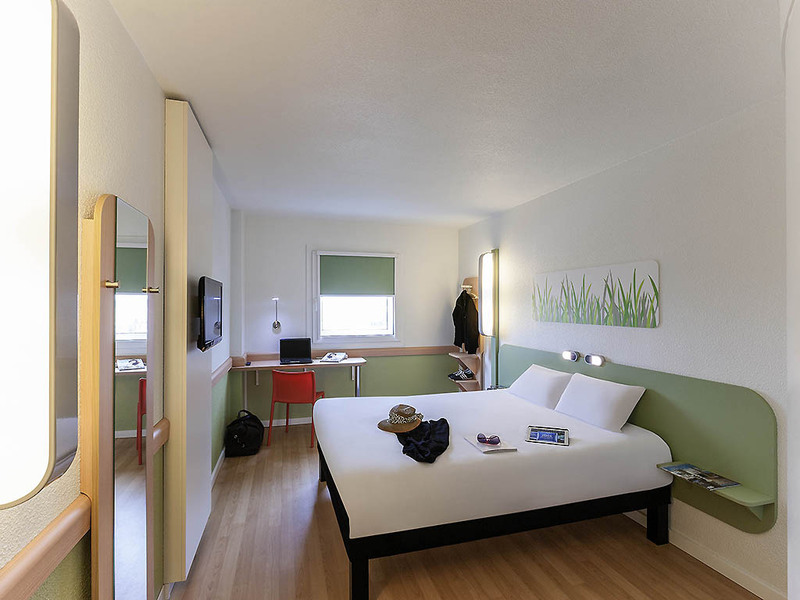 Spacious room with the usual good facilities of Ibis. Very friendly staff and great continental breakfast. Only 200 metres from ROSAS metro station ( N.B. Not Manises!) so very easy access to airport. You can also take a taxi of course and I understand that the hotel can organise that for you too. If I need to stay near this airport again I would certainly choose this hotel for the excellent quality and value. A pleasant, straight forward night close to the airport. The staff were most friendly & check in was easy, the staff even book Airport taxis for guests. The room is clean, a good size and has a nice large bed, television & wide shower. The Ibis efficient standard by a very efficient local team. Thank you for your dedication! Good apart from when I left the hotel at the end. I couldn’t get out of the gate. I had to knock hard on the glass door to get a response and the person who dealt with me was abrupt saying she had already told me what to do. No way to treat a customer. Clean and comfortable room. Close to the airport and convenient for public transport. Ideal hotel for the airport. Check in was easy, staff friendly. Short distance from airport, can get metro from rosas and we there in minutes. Room is very basic, only 2 pillows on the bed (1 per person) so sleeping was quite uncomfortable. A short two days stay, it is functional and it works. Easy to get there.